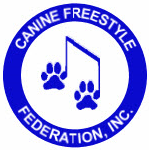 North Coast Canine Freestylers: Please contact NCCF-Freestyle@oh.rr.com for information. Canine Freestyle Federation (CFF) canine freestyle. · Do you have a good relationship with your dog or want to create a stronger relationship? · Do want the freedom to create your own test for a canine freestyle title? · Do you want to strengthen your skills in agility, obedience, and other dog sports and increase your dog’s versatility? · Do you want to explore basic obedience movements in a creative and artistic way? · Does the opportunity to try canine freestyle intrigue you, but the thought of having to dance turn you off? · Do you want to try a dog sport that is very different than any other dog sport you have tried? If you answered yes to these questions, then CFF canine freestyle may be for you. In the Intro to CFF Canine Freestyle class you will learn concepts and movements that will lay the foundation for starting you on your canine freestyle journey. After you have completed the class, you will be invited to join the North Coast Canine Freestyle Guild. You will join other freestyle enthusiasts that are developing CFF canine freestyle skills to present their dog to its best advantage. A routine is choreographed especially for each dog using music chosen specifically to highlight the dog’s natural gait. Showcasing the dog and dog movement. Period. No tricks or large handler movements or handler dancing, or costumes, or props. The emphasis is always on the dog, with the handler movements used to enhance the dog and the dog and handler each being an equal partner of the canine freestyle team. Choosing music to complement the natural gait, movements, and characteristics of the dog. · Having the dog tell the story and be the focus of the canine freestyle presentation; not the theme of the music, costuming, or props telling the story in the presentation. Turning technical obedience movements into creative and artistic canine-focused movement. Creating a presentation that showcases the best attributes of the dog and the relationship between the dog and handler. A CFF Titling event is a celebration of trained, creative, and artistic dog work and of each handler and dog team’s unique relationship.